The 2011 Professional Science Master’s (PSM) Student Outcomes Survey was conducted by the Council of Graduate Schools with a grant from the Alfred P. Sloan Foundation. 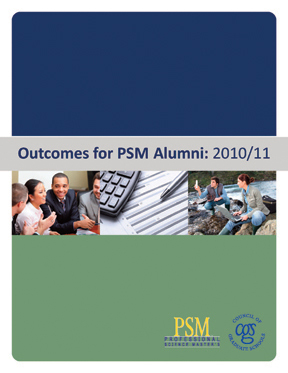 The survey was designed to capture initial hiring outcomes of PSM graduates and follow them for up to five years after graduation. The design was based on a review of more than 40 outcomes-related data collection efforts from more than 30 governmental agencies, non-profit organizations, and educational institutions. A draft version of the questionnaire was reviewed by numerous individuals affiliated with the PSM initiative, including members of the Board of Directors of the National Professional Science Master’s Association (NPSMA) and members of the Council of Graduate Schools PSM Advisory Board.